A diamond cut is one of the â€œ4Csâ€� used to determine a diamond's value. A diamond uses specific geometric proportions to shape a diamond before polishing. When a diamond is cut, facets are created. These facets determine the shape and appearance of the diamond. 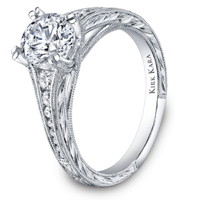 The cut of the diamond greatly determines the diamond's brilliance. When the cut is done poorly, the diamond becomes less luminous. Although a diamond may grade well using other determiners, a poor cut can result in a dull, muted effect. 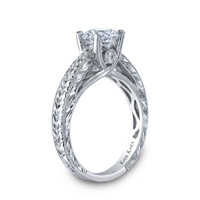 The cut of the diamond greatly affects the three main attributes of a diamond: brilliance, sparkle, and fire. These refer to the way the diamond plays with light. Brilliance is the amount of light reflected by a diamond. Sparkle refers to how a diamond shimmers when moved around a light source. And fire refers to the way the diamond disperses light and shows off different colors. If a diamond is poorly cut, these attributes can be diminished. If a diamond is cut too shallow and wide, it loses some of the light at its base. And if a diamond is cut too deep and narrow, the light escapes at the diamondâ€™s sides. On the other hand, a well cut diamond evenly reflects light in the diamondâ€™s interior, reflecting most of the light through its top surface. 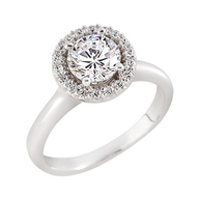 Certain factors decide the choice of diamond cut. The basis of a diamond cut is decided by the original shape of the rough stone, the location of internal flaws or inclusions, the preservation of carat weight, and the popularity of certain shapes among consumers. The cutter must consider each of these factors when cutting a diamond. A diamondâ€™s ability to catch and interact with light relies deeply on the way it is cut. It takes a skilled cutter to transform a rough diamond into a stunning gem. The most popular cut is the round cut. It has 58 facets in all and is said to be the cut that sparkles the most. There are also other cuts which are often referred to as fancy cuts. Most fancy cuts are grouped into four categories - modified brilliants, step cuts, mixed cuts, and rose cuts. All of these cuts have their own distinctive ability to catch and interact with light.